Download "Network Test Solutions. 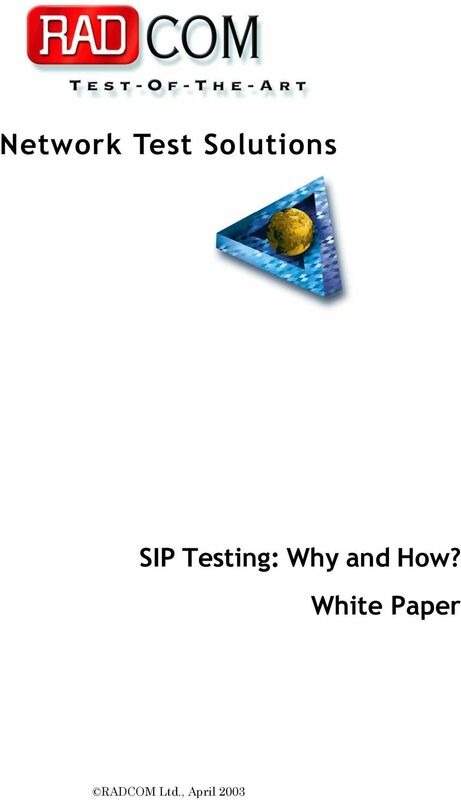 SIP Testing: Why and How? White Paper"
3 S IP Testing: Why and How? 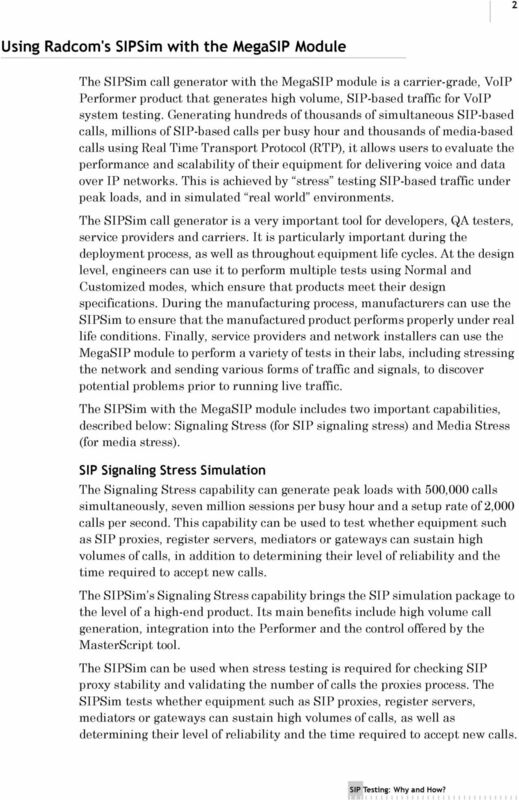 Introduction This document reviews the importance of the SIPSim call generator with the MegaSIP module, in testing SIP equipment for Voice over IP networks. 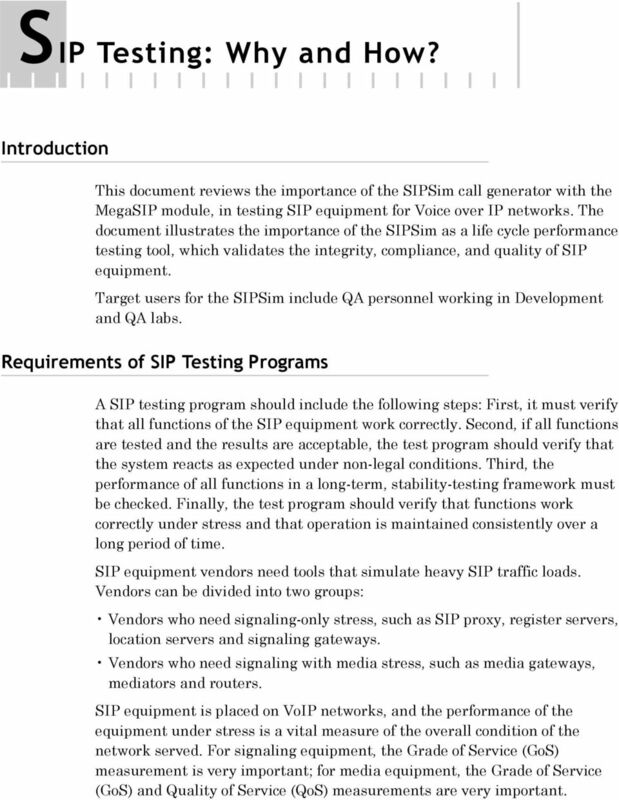 The document illustrates the importance of the SIPSim as a life cycle performance testing tool, which validates the integrity, compliance, and quality of SIP equipment. Target users for the SIPSim include QA personnel working in Development and QA labs. Requirements of SIP Testing Programs A SIP testing program should include the following steps: First, it must verify that all functions of the SIP equipment work correctly. Second, if all functions are tested and the results are acceptable, the test program should verify that the system reacts as expected under non-legal conditions. Third, the performance of all functions in a long-term, stability-testing framework must be checked. Finally, the test program should verify that functions work correctly under stress and that operation is maintained consistently over a long period of time. SIP equipment vendors need tools that simulate heavy SIP traffic loads. Vendors can be divided into two groups: Vendors who need signaling-only stress, such as SIP proxy, register servers, location servers and signaling gateways. Vendors who need signaling with media stress, such as media gateways, mediators and routers. SIP equipment is placed on VoIP networks, and the performance of the equipment under stress is a vital measure of the overall condition of the network served. For signaling equipment, the Grade of Service (GoS) measurement is very important; for media equipment, the Grade of Service (GoS) and Quality of Service (QoS) measurements are very important. 4 2 Using Radcom's SIPSim with the MegaSIP Module The SIPSim call generator with the MegaSIP module is a carrier-grade, VoIP Performer product that generates high volume, SIP-based traffic for VoIP system testing. Generating hundreds of thousands of simultaneous SIP-based calls, millions of SIP-based calls per busy hour and thousands of media-based calls using Real Time Transport Protocol (RTP), it allows users to evaluate the performance and scalability of their equipment for delivering voice and data over IP networks. This is achieved by stress testing SIP-based traffic under peak loads, and in simulated real world environments. The SIPSim call generator is a very important tool for developers, QA testers, service providers and carriers. It is particularly important during the deployment process, as well as throughout equipment life cycles. At the design level, engineers can use it to perform multiple tests using Normal and Customized modes, which ensure that products meet their design specifications. During the manufacturing process, manufacturers can use the SIPSim to ensure that the manufactured product performs properly under real life conditions. Finally, service providers and network installers can use the MegaSIP module to perform a variety of tests in their labs, including stressing the network and sending various forms of traffic and signals, to discover potential problems prior to running live traffic. The SIPSim with the MegaSIP module includes two important capabilities, described below: Signaling Stress (for SIP signaling stress) and Media Stress (for media stress). SIP Signaling Stress Simulation The Signaling Stress capability can generate peak loads with 500,000 calls simultaneously, seven million sessions per busy hour and a setup rate of 2,000 calls per second. This capability can be used to test whether equipment such as SIP proxies, register servers, mediators or gateways can sustain high volumes of calls, in addition to determining their level of reliability and the time required to accept new calls. The SIPSim s Signaling Stress capability brings the SIP simulation package to the level of a high-end product. Its main benefits include high volume call generation, integration into the Performer and the control offered by the MasterScript tool. The SIPSim can be used when stress testing is required for checking SIP proxy stability and validating the number of calls the proxies process. The SIPSim tests whether equipment such as SIP proxies, register servers, mediators or gateways can sustain high volumes of calls, as well as determining their level of reliability and the time required to accept new calls. 5 3 In the diagram below, a proxy vendor checks how a proxy behaves under different network loads. The SIPSim offers the vendor the options of Normal and Customized modes for performing the basic tests. It also offers the option of performance testing, where high volumes of calls can be generated through the MegaSIP mode in order to determine whether the proxy can stand the different loads. When stress testing is needed, the vendor generates hundred of thousands of SIP calls through the proxy to verify that the proxy can withstand such a load. 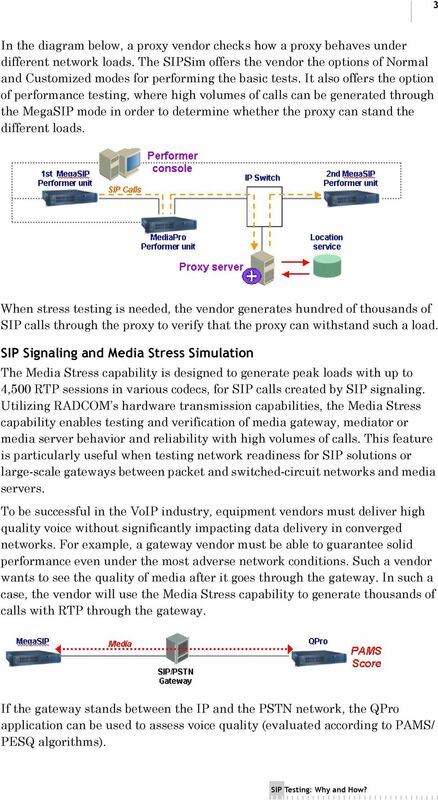 SIP Signaling and Media Stress Simulation The Media Stress capability is designed to generate peak loads with up to 4,500 RTP sessions in various codecs, for SIP calls created by SIP signaling. Utilizing RADCOM s hardware transmission capabilities, the Media Stress capability enables testing and verification of media gateway, mediator or media server behavior and reliability with high volumes of calls. This feature is particularly useful when testing network readiness for SIP solutions or large-scale gateways between packet and switched-circuit networks and media servers. To be successful in the VoIP industry, equipment vendors must deliver high quality voice without significantly impacting data delivery in converged networks. For example, a gateway vendor must be able to guarantee solid performance even under the most adverse network conditions. Such a vendor wants to see the quality of media after it goes through the gateway. In such a case, the vendor will use the Media Stress capability to generate thousands of calls with RTP through the gateway. If the gateway stands between the IP and the PSTN network, the QPro application can be used to assess voice quality (evaluated according to PAMS/ PESQ algorithms). 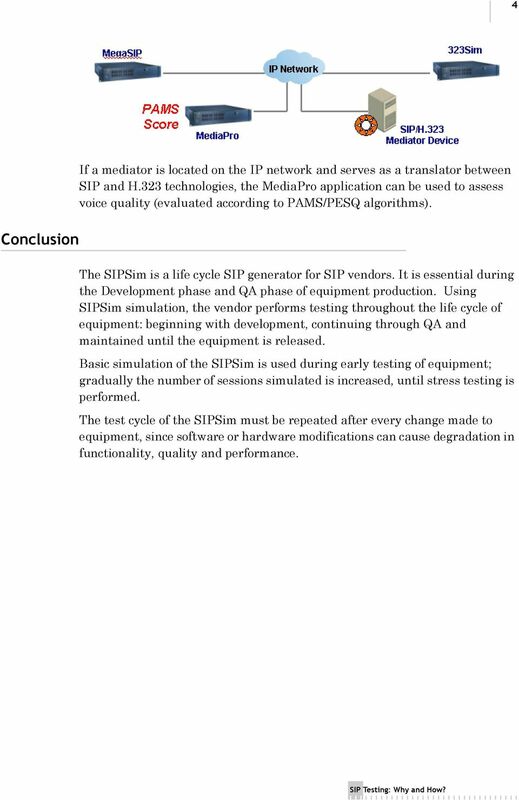 6 4 Conclusion If a mediator is located on the IP network and serves as a translator between SIP and H.323 technologies, the MediaPro application can be used to assess voice quality (evaluated according to PAMS/PESQ algorithms). The SIPSim is a life cycle SIP generator for SIP vendors. It is essential during the Development phase and QA phase of equipment production. Using SIPSim simulation, the vendor performs testing throughout the life cycle of equipment: beginning with development, continuing through QA and maintained until the equipment is released. Basic simulation of the SIPSim is used during early testing of equipment; gradually the number of sessions simulated is increased, until stress testing is performed. The test cycle of the SIPSim must be repeated after every change made to equipment, since software or hardware modifications can cause degradation in functionality, quality and performance. Network Test Solutions. 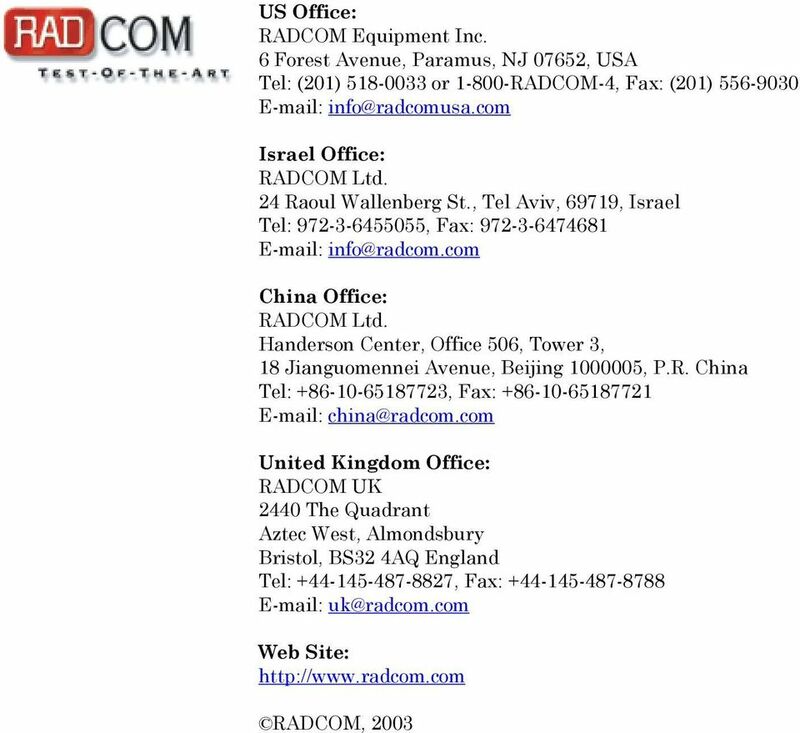 RADCOMmendation How to Test End-to-end IP-PBX Quality with RADCOM s QPro? Network Test Solutions RADCOMmendation Quality with RADCOM s QPro? 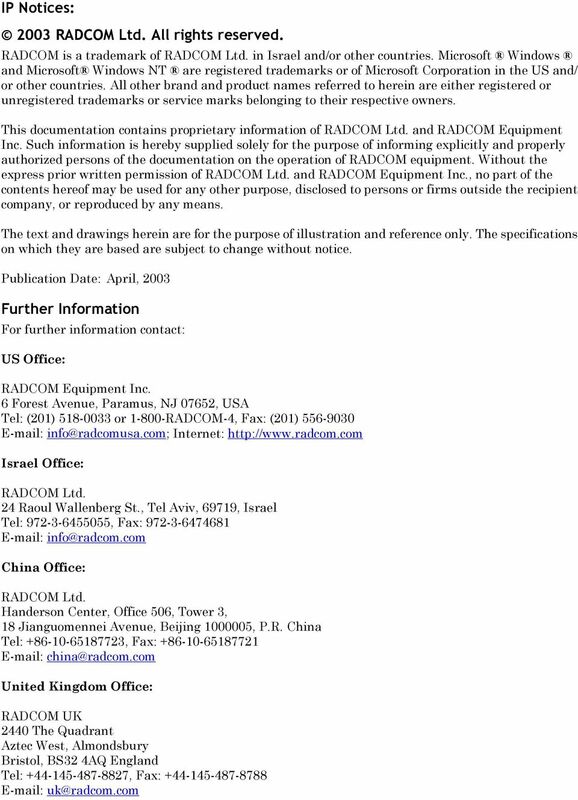 RADCOM Ltd., 2003 Copyright 2003 by RADCOM This documentation contains proprietary information of RADCOM Ltd. and RADCOM Equipment Inc. Testing IVR systems. White Paper. Document Number: Nexus8610 IVR 05-2005. Issue Date: May 2005. Number of pages: 14. File Name: IVR Testing Ed 2.0. Strong Authentication for Cisco ACS 5.x with Powerful Authentication Management for Service Providers and Enterprises Authentication Service Delivery Made EASY Copyright Copyright 2011. CRYPTOCard Inc. Customer Guide. BT Business - BT SIP Trunks. BT SIP Trunks: Firewall and LAN Guide. Issued by: BT Business Date 14.02.2012. Issue: v1.